This article is about the shared comic book universe. For the shared film and TV universe of heroes owned by Marvel Studios/Marvel Television, see Marvel Cinematic Universe. For other uses, see Marvel Universe (disambiguation). The Marvel Universe is a fictional universe where the stories in most American comic book titles and other media published by Marvel Comics take place. Super-teams such as the Avengers, the X-Men, the Fantastic Four, the Guardians of the Galaxy, the Defenders, the Inhumans, the New Warriors, the Nova Corps and other Marvel superheroes live in this universe, including characters such as Spider-Man, Iron Man, Thor, the Hulk, Captain America, Daredevil, Wolverine, Black Panther, Doctor Strange, Captain Marvel, Blade, Ghost Rider, the Punisher, Deadpool, Silver Surfer, Nova, Moon Knight and numerous others. Various characters of the Marvel Universe. Promotional art for the 2006–2007 miniseries Civil War by Steve McNiven. The Marvel Universe is further depicted as existing within a "multiverse" consisting of thousands of separate universes, all of which are the creations of Marvel Comics and all of which are, in a sense, "Marvel universes". In this context, "Marvel Universe" is taken to refer to the mainstream Marvel continuity, which is known as Earth-616 or currently as Earth Prime. Though the concept of a shared universe was not new or unique to comics in 1961, writer/editor Stan Lee, together with several artists including Jack Kirby and Steve Ditko, created a series of titles where events in one book would have repercussions in another title and serialized stories would show characters' growth and change. Headline characters in one title would make cameo or guest appearances in other books. Eventually many of the leading heroes assembled into a team known as the Avengers. This was not the first time that Marvel's characters had interacted with one another—Namor the Sub-Mariner and the Original Human Torch had been rivals when Marvel was Timely comics (Marvel Vault)—but it was the first time that the comic book publisher's characters seemed to share a world. The Marvel Universe was also notable for setting its central titles in New York City; by contrast, many DC heroes live in fictional cities. Care was taken to portray the city and the world as realistically as possible with the presence of superhumans affecting the common citizens in various ways. Over time, a few Marvel Comics writers lobbied Marvel editors to incorporate the idea of a Multiverse resembling DC's parallel worlds; this plot device allows one to create several fictional universes which normally do not overlap. What happens on Earth in the main Marvel Universe would normally have no effect on what happens on a parallel Earth in another Marvel-created universe. However, storywriters would have the creative ability to write stories in which people from one such universe would visit this alternative universe. In 1982, Marvel published the mini-series Contest of Champions, in which all of the major heroes in existence at the time were gathered together to deal with one threat. This was Marvel's first miniseries. Each issue contained biographical information on many major costumed characters; these biographies were a precursor to Marvel's series of reference material, The Official Handbook of the Marvel Universe, which followed shortly on the heels of Contest of Champions. The Marvel Universe is strongly based on the real world. Earth in the Marvel Universe has all the features of the real one: same countries, same personalities (politicians, movie stars, etc. ), same historical events (such as World War II), and so on; however, it also contains many other fictional elements: countries such as Wakanda and Latveria (very small nations) and organizations like the espionage agency S.H.I.E.L.D. and its enemy, HYDRA and A.I.M. In 2009 Marvel officially described its world's geography in a two-part miniseries, the Marvel Atlas. Most importantly, the Marvel Universe also incorporates examples of almost all major science fiction and fantasy concepts, with writers adding more continuously. Aliens, gods, magic, cosmic powers and extremely advanced human-developed technology all exist prominently in the Marvel Universe. (A universe incorporating all these types of fantastic elements is fairly rare; another example is the DC Universe.) Monsters also play a more prominent role with east Asian origins of magical incantation, outlandish sorcery and manifesting principle in the Marvel Universe. One such case is Fin Fang Foom arising from the ashes of tantric magic. Thanks to these extra elements, Earth in the Marvel Universe is home to a large number of superheroes and supervillains, who have gained their powers by any of these means. Within the fictional history of the Marvel Universe, the tradition of using costumed secret identities to fight or commit evil had long existed, but it came into prominence during the days of the American "Wild West" with heroes such as the Phantom Rider. During the 20th century the tradition was reinvigorated by Captain America and his fellow Invaders in the 1940s, who fought for the Allies of World War II. Most of Marvel's major heroes are those created during the Silver Age of Comic Books, including Spider-Man, Iron Man, Thor, the Hulk, Doctor Strange, Daredevil, Ant-Man and the Wasp, Black Widow, Hawkeye, Quicksilver and Scarlet Witch, the Vision, Groot, the Avengers, the X-Men, the Fantastic Four, the Inhumans, S.H.I.E.L.D., Nick Fury, Black Panther, Captain Marvel, Falcon, and the Silver Surfer. Marvel's other notable heroes from the Bronze and Modern Ages include Wolverine, Storm, Colossus, Nightcrawler, Luke Cage, Iron Fist, Misty Knight, Colleen Wing, Shang-Chi, Ghost Rider, Man-Thing, Blade, Morbius, Drax the Destroyer, Moondragon, Star-Lord, Gamora, the Punisher, Moon Knight, the Eternals, Adam Warlock, Nova, Power Pack, Rocket Raccoon, Psylocke, Scott Lang, Black Cat, Silver Sable, Kitty Pryde, Emma Frost, She-Hulk, Elektra, Cloak & Dagger, Rogue, the New Mutants, Jubilee, Venom and the New Warriors. Some of Marvel's more recent creations such as Deadpool, Gambit, Cable, Domino, War Machine, the Thunderbolts, the Runaways, X-23, Shuri, Daisy Johnson, the Winter Soldier, Maria Hill, the modern Guardians of the Galaxy and Defenders, Miles Morales, Hope van Dyne, Ms. Marvel, Kate Bishop, America Chavez, Moon Girl, and Spider-Gwen have become popular characters in their own right. Unlike the DC Universe, few of Marvel's 1940s characters have become major characters in modern publications; Captain America is one exception, and to a lesser extent, his contemporary, Namor the Sub-Mariner, primarily because both of these characters were reintroduced to readers and to the Marvel Universe during the 1960s. Prominent groups of superheroes include the Avengers, the X-Men, the Fantastic Four, the Defenders, the Guardians of the Galaxy, and the Inhumans. All these groups have varying lineups; the Avengers in particular, have included many of Marvel's major heroes as members at one time or another. The X-Men are a team of mutants led by Professor X and include some of Marvel's most popular characters, such as Wolverine. The Fantastic Four are "Marvel's First Family" of superheroes consisting of Mister Fantastic, the Invisible Woman, the Human Torch, and the Thing. The Defenders were an ad-hoc team usually brought together by Doctor Strange, which has included the Hulk, Namor the Sub-Mariner, and the Silver Surfer. The most recent incarnation of the team though consists of street-level heroes Daredevil, Jessica Jones, Luke Cage, and Iron Fist. The Guardians of the Galaxy include Marvel's cosmic characters such as Star-Lord, Gamora, Drax the Destroyer, Groot, and Rocket Raccoon, but the team has also introduced other heroes into the roster such as Iron Man and Kitty Pryde. The Inhumans are a species of genetically-engineered beings which include the Royal Family (consisting of Black Bolt, Medusa, Karnak, Gorgon, Lockjaw, Crystal, Auran, and Triton) and the NuHumans (Inhumans who have recently gone through the process of Terregenesis). Teams of supervillains exist as well though these are few and far between, but notable villain teams include the Masters of Evil, the Brotherhood of Mutants, the Sinister Six, the Frightful Four, the Black Order, the Annihilation Wave, the Starforce, and the Cabal. The battery effect; the cells in the body have the same function as batteries, being charged with energy that comes from an outer source. This is most often seen in gamma exposed individuals such as the Hulk, who get their powers from this stored energy. The powers will remain as long as the energy is present, and can even be increased by filling the "batteries" even more. If the energy is emptied, the powers will fade away. The Power Primordial is a leftover force from Big Bang and is controlled by the Elders of the Universe. The Phoenix Force is a force of incredible power. It channels energy from life itself and has been shown to favor mutant telepaths like Jean Grey. Psionic energy, which is assumed to be an invisible, unknown form of energy generated by all living brains that has the ability to manipulate other forms of matter and energy. Universal psionic field is a force present everywhere in the universe, but only those with abilities to connect to it can make use of its energy. Enigma Force is suspected to be connected to the Microverse, and is also the source to the Uni-Power, which transforms an individual into Captain Universe. Extradimensional space: dimensions that can be tapped in order to pull mass from them (to add to objects on Earth) or taken away from those objects and be stored in those "pocket dimensions" to be retrieved later. This is how characters like the Hulk can grow and shrink with no visible absorption of mass. A type of subatomic particles called Pym Particles can be used for these effects. (Note that many giant-sized characters have a limited ability to manipulate gravity to handle their increased weight.) The change in mass can be in the form of a density change instead, allowing a character to become harder or incorporeal. Some characters can seem to "transform" themselves (or others) into unliving substances, or even pure energy, by storing their bodies in extradimensional space and replacing them with bodies made from matter or energy from that dimension, while their souls remain on Earth, controlling their new body. Travel into other dimensions can also be used as a way to "teleport" by re-entering the Earth dimension at a different point from the exiting one. The Darkforce is an unknown, dark substance from another dimension (known simply as the Darkforce Dimension) that can be summoned and manipulated in many ways: to create impenetrable darkness, to solidify it in various forms, and (most notably) to absorb the "life energy" from living beings (not all users can use all these effects). The Darkforce can also be used to travel to and from its home dimension, but this is dangerous to all except those with Darkforce powers. Some believe that the Darkforce is sentient and sometimes has an evil influence on those who use it. Various heroes and villains have versions of Darkforce powers, including Darkstar, the first Blackout, the Shroud, Cloak, Doorman and Quagmire (of the Squadron Supreme Universe). Cloak seems to be the prime 'portal' to the Darkforce, however. The Living Light is the opposite of the Darkforce: a form of energy that resembles light and also comes from its own dimension, but has healing effects on living beings (except ones made of darkness or Darkforce.) It is unknown if it might be sentient. Cloak's partner, Dagger seems to be the Living Light's main Avatar. The Power Cosmic is a force that can alter reality, allowing the user to do whatever he or she wants (including bending the laws of physics), only being limited by how much cosmic energy the character can tap at a time. It seems to be part of the universe itself, and is most prominently used by Galactus and his heralds. Magic also appears to be like a form of energy, except that it can defy the laws of physics naturally, and usually overrules ordinary science. However, it does have rules of its own to follow, which vary with the method of invocation, usually in the form of spoken spells. It appears to be present in everything, even living beings. All humans in the Marvel Universe have the ability to use magic, but only if properly trained. Most people are unaware that magic actually works. In addition, powerful magical beings from other dimensions have created specific, extremely powerful magical spells that they allow to be used (often indiscriminately) by those sorcerers who invoke their names; one example is the trinity of beings called The Vishanti, who serve as patrons to heroic sorcerers. At any given time, there is a sorcerer on Earth whose task is to protect the universe against extra-dimensional mystical invaders; this sorcerer is known as the Sorcerer Supreme, an office left empty since the death of Brother Voodoo, but most recently has been reinstated to Doctor Strange. Stars in the Marvel Universe are actually sentient beings, and the source of all mystic energy. Pym particles are what make Ant-Man shrink. The Marvel Universe also contains hundreds of intelligent alien races. Earth has interacted with many of them because a major "hyperspace warp" happens to exist in the Solar System. The three are often in direct or indirect conflict, which occasionally involve Earth people; in particular, the Kree and Skrulls are ancient enemies, and the Kree-Skrull War has involved humans on several occasions. The Skrulls have also been known to be in a long and consistent war against the Majesdanians, who live in a milky planet named Majesdane. The war between the two had started after two Majesdanians, Frank and Leslie Dean of The Pride had been kicked out for criminal activities; the two travelled to Earth, where Frank and Leslie stopped the war against Earth in exchange for giving the Skrulls the location of Majesdane, which was hidden behind the corona of a white dwarf. The war had gone on for sixteen years minimum; it ended abruptly after the Skrulls shot a barrage of missiles at Majesdane, who retaliated. Another prominent alien race is The Watchers, immortal and wise beings who watch over the Marvel Universe and have taken a sacred vow not to intervene in events, though the Watcher assigned to Earth, Uatu, has violated this oath on several occasions. The Elders of the Universe are ancient aliens who have often had great impact on many worlds, for billions of years, acting alone or as a group. A power called Power Primordial is channeled through them. Many other races exist, and have formed an "Intergalactic Council" to have their say on matters that affect them all, such as interference from Earth humans in their affairs. Many persons and beings have falsely pretended to be gods or demons during history; in particular, none of the ones claiming to be major figures from Judeo-Christian beliefs has turned out to be the real article, although a number of angels have appeared in recent years, as well as an apparent true rebellion and expulsion of angels from a higher realm known as Paradise, proving that some form of Heaven and Hell do exist in this Universe, seemingly like those in keeping with common real world religious belief. Similarly, demons are evil magical beings who take affairs in the matters of the universe. Some of the most powerful are Blackheart, Mephisto, Nightmare, Satannish, and Zom. There are also powerful benevolent mystical entities such as The Vishanti; or amoral and malevolent entities who are not truly demonic in nature, such as Dormammu and The Octessence, or ones heavily drawing upon the mythologies of H.P. Lovecraft and Robert E. Howard. Some supernatural beings, entities and human characters created by Lovecraft & Howard, who were friends and influenced each other's work, have been adapted by Marvel and include Abdul Alhazred, Conan the Barbarian Nyarlathotep and Set. Some deities or demonic beings that are original characters of Marvel have been heavily influenced by these mythologies, such as Shuma-Gorath. Most of the current generation of gods have been revealed to be the descendants of the Elder Goddess Gaea. The two most featured pantheons are the Asgardians (of whom Thor is a member) and the Olympians (of whom Hercules is a member). The lords of the various pantheons sometimes gather in groups known as the Council of Godheads and Council of Skyfathers. The gods were forced to stop meddling with humanity (at least openly) a thousand years ago by the Celestials, and most people today believe them to be fictional. There are other pantheons that have been depicted in the Marvel Universe that are still actively worshipped in the real world including those worshipped by the Aboriginal inhabitants of Australia, the gods of Hinduism, the Shinto gods and the gods of Zoroastrianism. These deities are rarely depicted, however. One such appearance generated a good deal of controversy as the depiction involved a fight between Marvel's incarnation of Thor and the Hindu god Shiva, a battle which Shiva lost. As Shiva is one of the principal deities of Hindu religion, his defeat offended some followers of Hinduism. This battle was retconned later as having been the deity Indra, the Hindu god of thunder, who was posing as Shiva, that met defeat. In order to avoid offending believers of still active religions, Marvel features such deities as characters in the background or who make very brief cameo appearances. Marvel's depiction of vampires has been heavily influenced by various interpretations of popular media, such as Bram Stoker's Dracula. As with many other supernatural creatures, Marvel entwined the origin of vampires with aspects of the mythologies created by Lovecraft and Howard. They were originally created by magical rites performed by priests of Atlantis prior to the Great Cataclysm that destroyed much of the world with Varnae becoming the first vampire. Marvel would depict vampires as frequent antagonists during the Hyborian Age to Howard characters such as Kull and Conan. In recent years, Marvel's depiction of vampires has altered greatly by creating various subspecies of vampires that exist in clans that greatly differ in appearance and belief. All vampires are depicted with varying degrees of superhuman strength, speed, stamina, agility, reflexes and accelerated healing. Many are capable of transforming into animals such as bats or wolves, some can transform into a mist like substance; some of the most powerful are capable of controlling the weather to a somewhat limited degree. All vampires must ingest blood in order to maintain their survival and physical vitality. So long as they do so regularly, they cease to age and are immune to diseases. They retain the well known vulnerabilities common to vampires in other media interpretations including sunlight, garlic, religious icons and weapons made of silver. Vampires can be killed by a wooden stake driven through the heart, though they return to life if the stake is removed. Vampires are highly allergic to silver and can be killed with it. While they normally heal rapidly, injuries inflicted by silver weapons heal at a much slower rate if the injuries aren't fatal. Vampires can also be killed by decapitation or being set on fire, with burning them to ashes and then scattering the ashes being the most effective means of ensuring their demise. The Marvel Universe is part of a multiverse, with various universes coexisting simultaneously usually without affecting each other directly. [volume & issue needed] According to Reed Richards, the ultimate fate of the Multiverse is to perish in an all-encompassing heat death. The action of most Marvel Comics titles takes place in a continuity known as Earth-616. This continuity exists in a multiverse alongside trillions of alternative continuities. Alternative continuities in the Marvel multiverse are generally defined in terms of their differences from Earth-616. Days of Future Past- another dystopian reality where Sentinels rule North America and enslave mutants. Earth X- an alternate future for the Marvel Universe depicting an Earth mutated by the Terrigen mist. The reality was followed by two other series Universe X and Paradise X. Designated Earth-9997. Earth-92131- The universe of X-Men: The Animated Series, Spider-Man: The Animated Series, Fantastic Four, Iron Man, and The Incredible Hulk. Earth-200111 - the reality of The Punisher MAX, Born (and its sequel Punisher: The Platoon), Wolverine MAX, Foolkiller MAX, Fury, and Fury: My War Gone By. A world without traditional superheroes and a gritty, realistic, violent universe. Earth-30847 - The reality of the Marvel vs. Capcom games. Larval Universe- the home reality of Peter Porker (aka Spider-Ham) a reality where animal-themed versions of Marvel superheroes exist. Marvel Noir- a reality home to noir versions of superheroes. Marvel 2099- a reality showing a possible future for the Marvel Universe in the year 2099. Marvel 1602- A reality where Marvel superheroes emerged in the early 1600s. This reality became Earth-311. Marvel Mangaverse- A reality home to Manga versions of Marvel characters. Marvel Apes- A reality where apes are the dominant species and the superheroes are apes themselves. Marvel Cinematic Universe- a shared cinematic universe by Marvel Studios consisting of the Avengers, the Guardians of the Galaxy, Spider-Man, Black Panther, Captain Marvel, Doctor Strange, Ant-Man and many other characters such as Daredevil, Cloak and Dagger, the Agents of S.H.I.E.L.D. and The Punisher as well as The Defenders, The Runaways and Inhumans. It is designated as Earth-199999. Earth-12041, an animated version of the Marvel Universe on Disney XD. The shows part of this universe include Ultimate Spider-Man, Avengers Assemble, Guardians of the Galaxy, and Hulk and the Agents of S.M.A.S.H..
Marvel Zombies- a reality where all the Marvel superheroes were turned into zombies. Designated as Earth-2149. MC2- another alternate future for the world of the Marvel Universe and its heroes and villains. The designation of this Earth is Earth-982. New Universe- An alternate reality where a major catastrophe known as "White Event" caused numerous people to develop superpowers in a world where there are no hidden races, gods, magic, and super technology. The home reality of Star Brand. Old Man Logan, a dystopian alternate future where the super villains killed all the superheroes and took over the United States (and presumably the world) dividing it among themselves. The home reality of the titular Old Man Logan (an alternate version of Wolverine and designated as Earth-807128). Ruins- a reality where "everything that can go wrong will go wrong" where the experiments and other incidents that granted the superheroes their powers instead resulted in horrific consequences and deaths. Shadowline- a horror imprint separate from the mainstream Marvel continuity. Earth-712- the home of the Squadron Supreme a super-team from another universe and pastiches of DC Comics Justice League. Ultimate Marvel- a modern-day reimagining of Spider-Man, the Ultimates, the X-Men, the Fantastic Four, S.H.I.E.L.D. as well as other Marvel heroes and villains in a new setting. The home reality of Miles Morales, the Maker (aka Reed Richards), and Jimmy Hudson. Ultimate Marvel is also known by its designation Earth-1610. Earth-65- a reality where Gwen Stacy was bitten by the radioactive spider instead of Peter Parker (who became the Lizard in this universe and died) where Gwen became a superhero it also includes variations of other Marvel characters such as a gender bent version of Sam Wilson (known as Samantha Wilson and became Captain America instead of Steve Rogers). Ultraverse- the home of the super-team known as Ultraforce and superhumans known as Ultras. Earth-96283- An alternate reality in which Spider-man is the only super hero on Earth. Sam Raimi's Spider-man trilogy created and takes place here. In addition, multiple continuities are visited in the comic book series What If, What The--?! (formerly Not Brand Echh) and Exiles. The concept of a continuity is not the same as "dimension" or "universe"; for example, characters like Mephisto and Dormammu hail from alternative dimensions and Galactus from another universe, but they all nevertheless belong to the Earth-616 continuity (where all the dimensions and universes seems to be connected to the same main timeline). A continuity should also not be confused with an imprint; for example, while the titles of some imprints, such as Ultimate Marvel, take place in a different continuity, some or all publications in other imprints, such as Epic Comics, Marvel MAX, and Marvel UK, take place within the Earth-616 continuity. Within and sometimes between continuities, there exist a variety of dimensions, sometimes called pocket dimensions which typically are not depicted as separate continuities, but rather part of one, typically Earth-616. There are a score of such dimensions, ranging from the Earthlike to the totally alien. Some are magical in nature and others are scientific; some are inhabited and others are not. These include realities like the Microverse, the Darkforce Dimension, Limbo, the Mojoverse, and many more. The Astral Plane is a dimensional plane which is the source of telekinesis and various other psychic powers. It is a dimension created by the Elder Goddess Oshtur that is sometimes referred to as the "Temple of Oshtur" or the "Realm of the Mind". One cannot normally alter the Marvel Universe's history; if a time-traveller should cause an alteration to the established flow of events at some point in the past, a divergent universe will simply "branch out" from the existing timeline, and the time-traveller will still return to his or her unaltered original universe. Those realities can also spawn realities of their own. There exists hundreds, probably thousands of such realities. It is unknown why this happens, though a warp known as the Nexus of All Realities exists in a swamp in the Florida of Earth-616. For the most part this does not matter, as most beings are unaware that this occurs, or even that their universes were recently "born" from another. However, individuals and organizations exist that try to monitor or manipulate the various realities. These include Immortus, the Captain Britain Corps, the Time Variance Authority, the Timebreakers/Exiles, and Kang the Conqueror's forces. It has been shown to be possible to travel through time without creating a new alternative universe, instead altering events in the future, but this seems to have devastating and very far-reaching repercussions, as depicted in Marvel 1602 (it almost destroyed the whole multiverse, including the afterlife). Also, time itself passes much differently within the confines of the Marvel Universe than it does in the real world. Despite various characters having appeared within company publications for decades, few if any have aged to any appreciable degree. For example, the patriotic hero Captain America was created in 1941 but stopped appearing in titles soon after the end of World War II. The character was revived more than twenty years later, explained as having been frozen in a block of ice though believed to be dead, to lead Marvel's latest team of superheroes the Avengers. This first Avengers team featured several characters that would go on to be some of the company's most famous and most popular. Although the characters would be portrayed in hundreds and even thousands of adventures over the decades, they have been portrayed as having aged little or none at all. Naturally this tendency is purely due to story conveniences (or a somewhat haphazardly shifting patchwork pattern of authors), and mainly that the fictional "continuity" has been maintained and expanded far beyond what Stan Lee and others originally planned or hoped for. Hence, the passing of time was more discernible in the very early years, such as the graduation of Spider-Man; and what started as children or teenaged characters, such as Kitty Pryde, Franklin Richards, Valeria Richards, Power Pack, or the New Mutants are all allowed to age at wildly shifting rates (in the second case even backwards at times), whereas surrounding characters somewhat dependent on a certain age limit do not change at all. This recurrently creates inherently contradictory effects, as events are routinely described to have happened several years ago, even in cases when this would mean that some of the involved characters would have been toddlers. Different approaches also exist regarding allowing "second-generation" descendants of heroes or villains, fully grown over 18 years after an event (for example Hulkling, other members of the Young Avengers, Runaways, and Secret Warriors), whereas other books, such as Young Allies use the inherent contradiction to debunk similar claims. If a past storyline wherein a direct depictions of a then-current president or similar is referred to in a later era, it tends to become updated accordingly, sometimes with an "in-joke" acknowledgement. A more recent explanation was given by Galactus to the Ultimates, namely that some important events - for instance, the creation of the Fantastic Four or the Avengers - have a 'gravity' all their own and warp time around them, causing the timeline to subtly change to accommodate this. 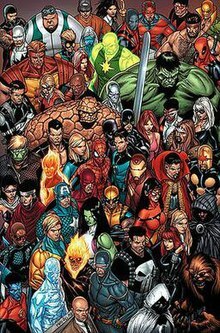 While the Marvel Universe is presumably as large as the non-fictional universe comic book readers inhabit, for all intents and purposes the Local Group is the universe; practically all action takes place in it. The Skrull Empire is located in the Andromeda galaxy, the Kree Empire in the Magellan clouds which are satellites of the Milky Way galaxy in which Earth of course is found, while the Shi´ar Empire is located somewhere between them in one of the smaller galaxies (perhaps Triangulum); frequently, these three empires are quoted as the main political powers "in the universe". Similarly, the Local Group seemed to be the only affected area when the Annihilation Wave cut its bloody swath "across the universe". For more complete lists of inhabitants of the Marvel Universe, see List of Marvel Comics characters, List of Marvel Comics teams and organizations, and List of Marvel Comics alien races. ^ Triangulum is the third-largest galaxy of the Local Group and located more or less between the two main members, Andromeda and the Milky Way. ^ "Earth-96283". Marvel Database. Retrieved 2019-01-22. ^ Mystic Arcana: The Marvel Tarot One Shot, Marvel Publishing, Inc. 2007.